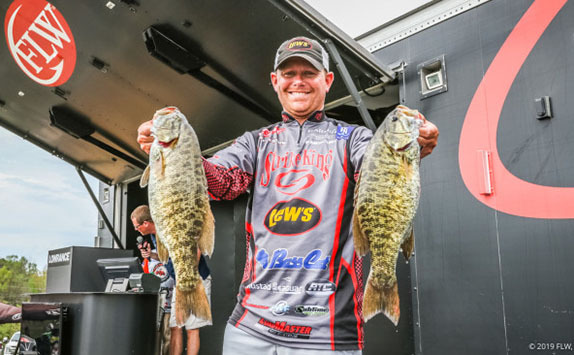 Andrew Upshaw says he's "having a blast" catching Cherokee Lake's bedding smallmouths. Andrew Upshaw has a distinct advantage, and he’s making the most of it thus far. In practice for the FLW Tour event at Cherokee Lake, the Tulsa, Okla., pro figured out quickly how hard the lakes smallmouths were pushing to spawn. That gave him three days to figure out exactly how they were setting up and mark as many as he could. All told, he figures he marked more than 120. Well, he’s barely even scratched the surface on all the ones he’s marked, and he was still able to extend his lead, bringing in 17-14 on day 2 for a 36-04 total. While Upshaw retained his No. 1 spot, Dylan Hayes also held steady in 2nd, bringing in another 16-11 worth of largemouths for 34-08. That said, nearly as much weight separates him from Upshaw as it does from 10th place. Austin Felix moved up to 3rd thanks to a “lucky” 17-01 bag, while Grae Buck jumped to 4th via the third-largest bag of the day (17-10). 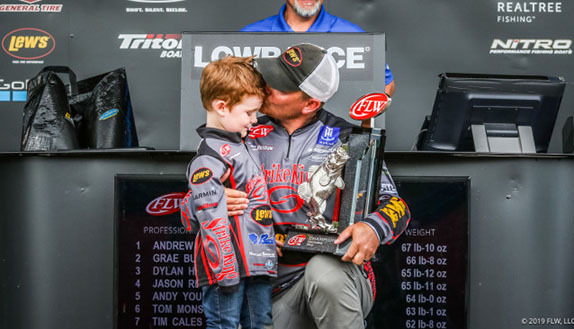 Tim Frederick continued to surprise himself, as the Florida angler is a mere 15 ounces behind Hayes despite admittedly not knowing much about smallmouth. Of course, Michigan native Ron Nelson knows plenty about them, and he’s brought in near identical 16-12 and 16-13 bags the first two days. 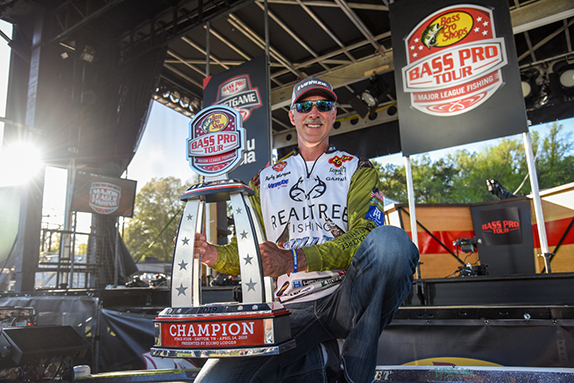 Kurt Mitchell made the biggest jump of the day, as he swung for the fences with largemouth and connected to the tune of 19-07. Rounding out the top 10 are Tom Monsoor, local Derrick Snavely and Joey Cifuentes. While Cherokee showed out again in terms of the number of fish caught, Upshaw is clearly the most dialed in thus far. That showcased itself when he caught a kicker 4 1/2-pounder within the first 15 minutes on day 2. From there, he said he caught a limit “just to settle himself down” before trying something he’d never done before. 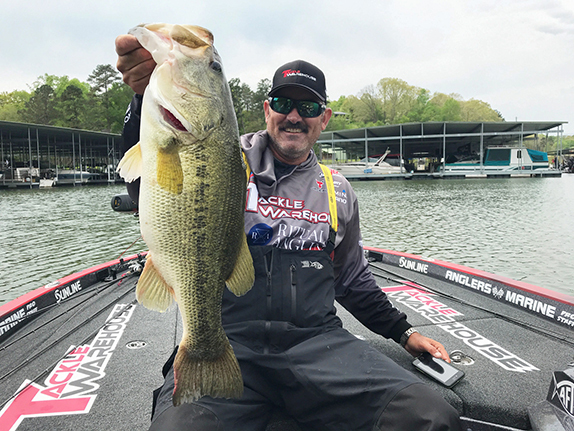 Having aggressive spawners is a nice thing, but what Upshaw says has really allowed him to separate himself is knowing exactly how the fish are setting up on specific pieces of structure. That’s allowed him to go in behind guys and still catch fish, and when he does get in one of his areas – most are no bigger than the size of his boat – he’s able to catch as many as eight fish from it. Yet, what had him most excited about today was a new, non-spawning pattern he figured out late in the day. Meanwhile, Hayes continued to milk a tiny staging area way up the river, targeting largemouths. He’s not getting the 30 or more bites the smallmouth anglers are, but he’s sure getting the right bites. It’s just a matter of figuring out exactly where they are as they stage. While he may not know why they’re on one side or another, he is happy he continues to get some big bites power-fishing with a jig, as well as mixing in a spinnerbait today. Then there’s Felix. A noted smallmouth angler from Minnesota, one might think he’d be in heaven solely targeting brown fish. Instead, he’s been bringing in mixed bags thanks to some good fortune. One thing that did make things harder for him and the majority of the field was a steady rain that fell for a good portion of the day. Felix said the clouds and rain made it much harder to see any dark spots or rock edges that would indicate better places to pitch a lure to an unseen bedding smallmouth. Yet, with a much better forecast for tomorrow and with another 10-12 pounds marked from today, Felix still is optimistic he can get more dialed in and make a run at Upshaw. > Day 2 stats – 164 anglers, 147 limits, 9 fours, 3 threes, 2 twos, 2 ones, 1 zero.